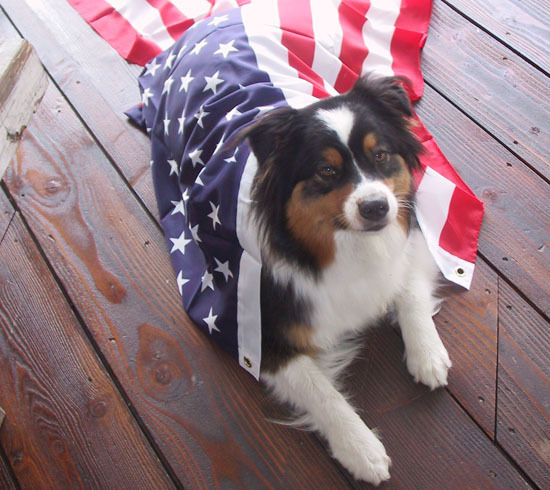 You Are Here: Home » holidays » Yankee Doodle Dog: Happy Fourth of July! I love a parade and a big party on the 4th. We have a lot of friends over for turkey dogs, chicken dogs, sausages, watermelon and fireworks viewing every year. So many choices of people to beg from, so little time! And my good friend Bella — I’m glued to her; she loves to give me treats. Have a great day! One Response to Yankee Doodle Dog: Happy Fourth of July! So pretty and a true patriot. She’s not Australian you know. Her heritage was formed right here in the good old USA.